Starting from a base supply of 189.2 FTE professionals in 2011, the ROMP baseline model projects a supply of 267 FTE professionals in 2017 and 327 in 2022. In 2017, with an utilisation rate of 45.2%, 410 FTEs would be required, resulting in a shortfall of 143 FTEs. If the target utilisation rate of 52.3% is to be achieved by 2022, the model projects that 535 FTEs would be required in 2022, resulting in a workforce shortfall of 208 FTEs (see Figure). 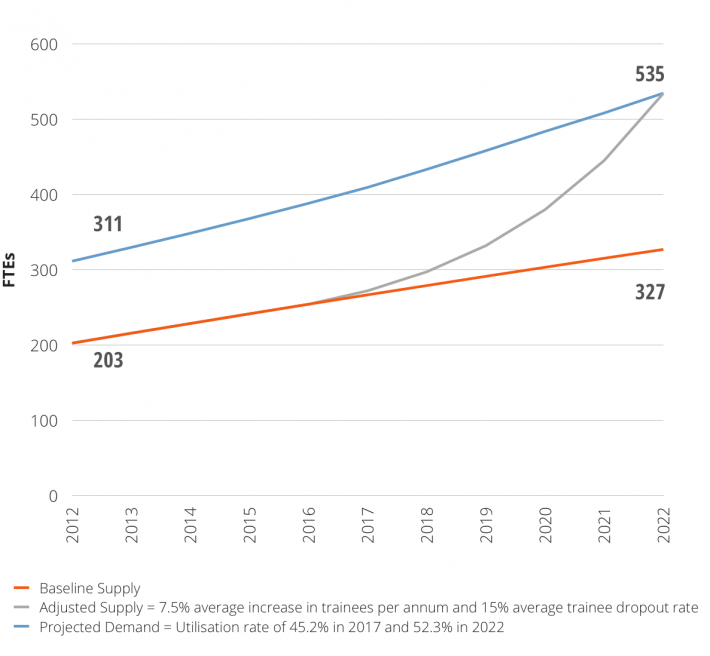 In order for supply to meet target utilisation in 2022, the intake of trainees over the years 2012 to 2017 needs to increase, on average, by around 35% each year (resulting in an inflow of 94 FTE trainees into the occupation in 2022, assuming the dropout rate from the trainee program remains at 1 %). Historical data indicates that the intake of trainees has been increasing at a rate of only 6% per annum over the last seven years.